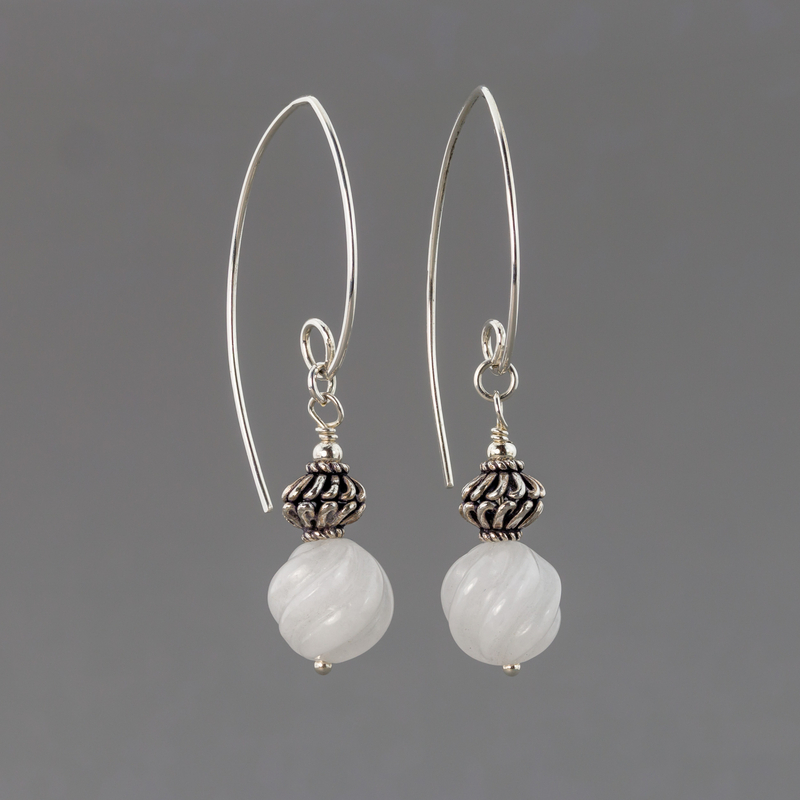 Carved round snow white quartz beads are paired with coiled sterling silver Bali style beads in these elegant artisan earrings. The pretty white quartz beads have deep twisting ridges carved into them like a creamy soft-serve "twist". The wire work Bali silver bead also displays the same fluid twisting design. The suggestion of motion from both beads is accentuated as they dangle from an elegant and long marquise ear wire of shining sterling silver. The earring dangles comprise a carved white quartz natural stone bead, 10mm (3/8-inch) in diameter, a 7mm slightly flattened round Bali silver bead made of open wire and decorated with tiny rope detail at the top and bottom edges, topped with a smooth round sterling silver bead, about 2.5mm in diameter. The three beads are neatly strung on bright sterling silver headpins with a tiny ball on the end. The dangle is simple: three beads, silver and white, but with the twisting lines of the carved bead and the wire coils in the Bali bead creating highlights and shadows there's more than first meets the eye. To suspend these beaded dangles I chose to make a lovely long and elegant marquise ear wire. The tail of the ear wire is a long uninterrupted curve from the peak of the earring extending past the silver bead. This long tail, while it is pretty, aids to balance the heftiness of the dangle. I hammered the ear wire but polished out most of the tool marks for a very bright finish. The highly polished silver and the elegantly shaped ear wire complement the unique carved white quartz beads. Even though they are not "gemmy" jewels, the elegance and simplicity along with the white and silver color scheme of these handcrafted earrings suggest them for the bride who might want something a little different on her special day. Of course, you don't have to be a bride to wear or give these handcrafted earrings. Make any day special. These quartz and silver earrings are the perfect accessory for the white or pastel fashions of spring and summer, or consider them "winter whites" for your glamorously simple New Year's Eve.